Hello everyone and greetings for Panama City, Panama.Â Although I have only been in Panama for two weeks, I feel I have experienced so much.Â The way of life here, the people, the traffic, and the food may seem extremely different to someone who is not open to learning or fully immersing themselves within the culture.Â There are many differences between Panama and the United States however; I do not think these differences are as prevalent as people may think.Â By observing and speaking to the locals, I have come to realize they are trying to get out of life the same things people in other countries are only they have a different approach on how to achieve it. I have met many Panamanians who attend UofL Kentucky and have talked to them about their country and some of the similarities and differences between the two.Â I do not know if itâ€™s because I already had an idea about what to expect when coming here or because I am a very open minded person but I am surprised I do not (and have not) had a huge feeling of culture shock.Â Because I tend to hang out with the Panamanians in Kentucky, I am used to not understanding much, if any, of what they are talking about and therefore it doesnâ€™t bother me when I am surrounded by it here. I am surprised at how Americanized Panama city is, especially the supermarket.Â It was not hard to find what I was looking for.Â Even if I didnâ€™t understand what the entire label said, I knew and recognized the brand so I could figure it out.Â The amount of fast food and common restaurants (what you see in the States) also surprised me a little.Â I think I expected more local restaurants.Â The other â€œshockingâ€ thing that I have experienced (even though I was told about it ahead of time) was how nice and friendly complete strangers are to me.Â The people here are willing to talk to you and get to know you.Â They do not make fun of the way I speak Spanish, especially since I do not know that much.Â On the contrary, they are quick to help in correcting my grammar so I donâ€™t continue saying it incorrectly and are willing to teach me more of the language. I think the worse thing about Panama by far is the traffic.Â Not only are there an incredible number of cars and taxis all trying to drive down the same stretch of road at the same time but the way in which these people drive on an everyday basis is typically not seen in the United States.Â I have heard many Panamanians who I have talked to say that if you can drive in Panama you can drive anywhere.Â I used to think rush hour in Louisville was bad but the three different rush hour times they have here are much more congested.Â The drivers here do not give pedestrians the right away and do not abide by the road signs (although I have notice there really aren’t that many street signs compared to the US). A huge difference between drivers here and in the States is the frequency in which people here use their horns.Â Every hour of every day you can hear horns being honked.Â This is a form of communication, not only between the drivers themselves but between the drivers and people walking along the sides of the roads.Â If a taxi driver sees you walking along the street (especially if you are a Gringo) he will honk his horn to let you know he is available to take you wherever you want to go.Â While this is the case, most tend not to slow down and therefore pass you before you even have a chance to hail them down.Â In the US, I have noticed that when someone honks it’s usually to get the attention of someone else.Â I have a habit of waving to whoever honks, just to be friendly.Â The first time I heard a car honk I just absentmindedly threw my hand up in the air to wave and a taxi pulled over to the curb.Â I didn’t need a cab and was just trying to be friendly but I’ve realized this is an inefficient way to do that. Honking is also a way for a driver to let another driver know he is passing him.Â I have noticed Panamanian drivers are very impatient.Â For example, if one is stopped at a red light with someone in front of them and the light turns green, that driver better put the pedal to the metal if he/she wants to avoid being honked at.Â While the honking system of communication seems to work fairly effectively in Panama, it tends to get obnoxious to people like us who are attempting to sleep and all we can hear is beep, beep, beep. The phrase â€œtime is of the essenceâ€ does not seem to resonate with Panamanians.Â â€œPanamanian timeâ€ is much different than what I am used to.Â Here when someone tells you to meet at a certain time they usually mean about an hour or more later than the specified time.Â At home, when people specify a time they mean show up at that time and being late is frowned upon.Â The people here are much more relaxed and go with the flow a lot better than majority of the people in the States.Â The best example of this is when I told a Panamanian to meet me at 8ish, which in US terms means give or take ten to fifteen minutes.Â In Panamanian time it means at least a half-hour to an hour later.Â Luckily the plans we had made did not need to be at an exact time or else we would have missed them. Another thing I have noticed is that people in the United States tend to always be thinking about the future and donâ€™t really live in the present.Â Panamanians, however, look at the here and now.Â This isnâ€™t to say that they donâ€™t think about the future, but they seem more concerned about whatâ€™s going on today and not a couple years from now.Â One possible reason for this may be because of all the family businesses that are in Panama (this is just a speculation).Â Many of the Panamanians I have met all have parents who own their own businesses and therefore a lot of them will be taking over the family business when they finish their school.Â Most of them therefore will not have to worry about finding a job when they graduate because they are almost 100% guaranteed to have one in the future.Â This is not necessarily the case with all Panamanians and is definitely not the case with US students (at least the people I know).Â There are many people who have graduated with good degrees and are still having problems finding a job which is why people in the States start worrying about getting a job before graduation. I was really excited to come to Panama, not only for the experience of being in a different country but getting to play soccer with people who actual care about and follow the sport.Â Soccer is becoming more popular in the States but it is still really behind compared to the rest of the world.Â One of the big things I noticed when playing soccer down here is females do not play.Â The first time my friend and I showed up to the field we received funny looks from the guys because they are not used to seeing girls walk in with soccer cleats in their hands ready to play.Â Most females sit on the sidelines and act as cheerleaders instead of playing.Â I think they guys were also unsure about whether my friend and I were able to play and keep up with them.Â Since we both have been playing soccer since we were little, we were able to play alongside the guys without any problems and they realized this because they have invited us to come back and play with them on a couple different occasions. Another thing I noticed that is different about playing soccer here versus the States are the fields they play on.Â Because Panama doesn’t really have any state parks with soccer fields, the fields are synthetic and enclosed.Â If you want to play you have to sign up for a time and you pay to play for an hour.Â This keeps the game moving at a fast pace because you want to get as much playing time in as possible.Â The fields are also smaller than regulation fields and therefore they play with 6 people on the field including the goalie.Â The rest of the people sit out and switch in when a team scores two goals or they have been playing for ten minutes. Panamanians are very individualistic soccer players, meaning they have a lot of foot skills and want to challenge each other one on one and school each other.Â I am used to passing the ball and making give and go runs so sometimes it gets frustrating when they don’t pass or include others when playing.Â I love playing soccer with people who are passionate about the sport though and I’m glad they recognize that my friend and I are decent players who play for the love of the game. Panama is a wonderful country, full of friendly and welcoming people.Â I will be very sad when I have to leave but the friendships I have made while being down here and the experiences I had been a part of are unforgettable. As May rolls around, I canâ€™t believe that I have lived in France for so long and that this wonderful experience will come to an end in about six weeks. This truly has been one of the most amazing experiences of my life and I wouldnâ€™t have traded it for the world. 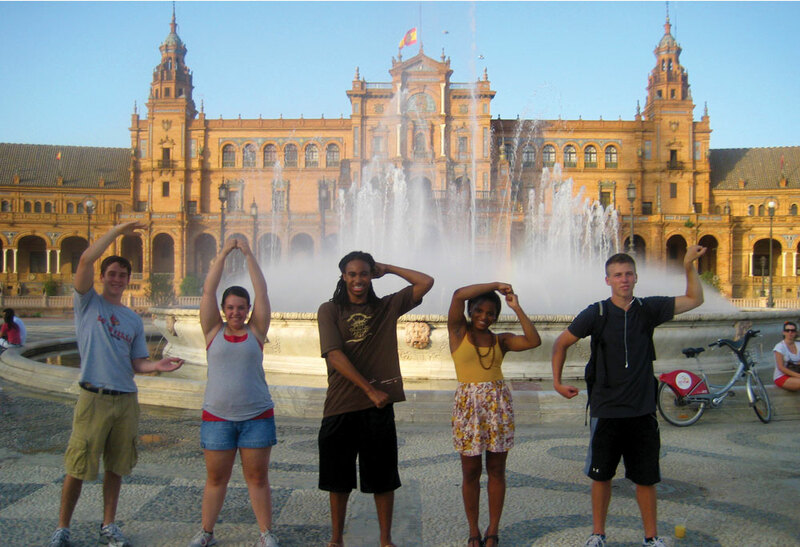 If given the opportunity, I recommend that every student studyâ€™s abroad during their college career. The time spent over here has taught me so much about myself and my culture, as well as an appreciation for other cultures throughout the world. While the majority of the international students at BeM speak English fluently, they come from all over the world and I have made friends with people from pretty much every continent. The intermingling of all the different cultures has truly made me more aware of the differences and taught me how to work with them in terms of business and everyday life. In terms of school, BeM is quite different than Louisville. The courses are broken up into three week sequences, one course per three weeks. Generally, we have class from 8:30-4:30 (with breaks) but there are a lot of half days and days without class so it never becomes overwhelming. Due to the fact that a course is so short, there arenâ€™t many written exams or finals but we do have group projects which usually consist of a large paper and presentation analyzing a companyâ€™s strengths, weaknesses, risks, innovations, etc. These projects are where the cultural dynamics really come into play. You see which aspects of business each culture views as important and adjust the project to cater to these different aspects and work ethics. So far, I have taken two business courses in English, one French language course, one French business course, and will finish the semester with two more French business courses. The French courses have proved to be quite challenging but manageable. I have learned so much about French business as well as the language itself. Donâ€™t worry though, students are not required to take courses in French and most of the internationals stick with the English courses. The student life is also slightly different too. The school is much smaller, 1,500-2,000 students; however, there are plenty of organizations to join such as the wine club, cinema club, sports club, or Melting Potes (international club.) Each of these organizations hosts parties and other events for students both in and out of their organizations so itâ€™s easy to meet non-internationals as well as becoming integrated into the school. The city itself is stunning and in my opinion one of the most beautiful in France. The city sprawls out throughout the red-wine region of France but the majority of the historical monuments, parks, boutiques/shopping districts, and old restaurants are located in the Centre Ville. If you do plan to come here I highly recommend that you only look for apartments in the city center. Everything is easily accessible by foot (no more than a 20 minute walk anywhere) but there are three tram lines that meet up here and go all throughout the city. Its relatively inexpensive 1.4 euro per trip or about 25 euro for an unlimited monthly pass. The city just implemented a new bike rental program where you can pick up a city bike at most tram stops. Itâ€™s free for a half hour and 1 or 2 euro for the day. I know a lot of people who ride them to school every morning but they are also convenient to use after the trams stop and you want a fast way home. Throughout Bordeaux there are a ton of cute shops and cafes so itâ€™s a great city to just walk around or people watch from time to time. Now that the weather has become nicer, the city has become much more alive with people everywhere. We have made it a habit to spend afternoons in the Jardin Publique or along the Quai to just hang out. Bordeaux is about 40 minutes by train away from lovely beach cities which also make fun weekend or afternoon activities! Traveling in Europe during a study abroad is a must. Since you will already be over here, I recommend going to as many different countries as your budget will allow. I recently returned from a trip to Greece for about 5 days, but I have also visited cities in Spain and France. This is the best age to visit famous cities since the majority of tourist sites are discounted or free for EU students. The majority of what you spend money on is transportation, food, and living. Traveling is super easy and itâ€™s always possible to find cheap planes through RyanAir or EasyJet (just beware of their additional fees and know exactly which airport they are taking you to.) Trains are another easy way to travel especially in France. If you come, get the 12-25 card which costs 50 euro but gives you at least half off of every train ticket you purchase; mine paid for itself after 3 tickets. I cannot express enough how amazing this experience has been and one that I think every student at U of L should make. If you have any questions about BeM or study abroad in general please contact me!